Adaptive Vision Library is designed to be a part of applications working under control of the Microsoft Windows operating system. Supported versions are: Vista, 7, 8 and 10, as well as the corresponding embedded editions. To build an application using Adaptive Vision Library, Microsoft Visual Studio environment is required. Supported versions are: 2010, 2012, 2013, 2015 and 2017. Adaptive Vision Library can be also used on Linux operating system with GCC compiler - for details consult Using SDK on Linux article. The installation process is required to copy the files to the proper folders and to set the environment variables used for building applications using Adaptive Vision Library. After the installation, a license for Adaptive Vision Library product has to be loaded. It can be done with the License Manager tool available in the Start Menu. To verify that the installation has been successful and the license works correctly, one can try to load, build and run example programs, which are available from the Start Menu. Adaptive Vision Library is distributed as a set of header files (.h), dynamic (.dll) and static (.lib) libraries. The libraries (static and dynamic) are provided in versions for 32-bit and 64-bit system. The header files are common for both versions. The picture below shows the structure of the directories containing headers and libraries included in Adaptive Vision Library. The directories (installed in the Program Files system folder) being a part of Adaptive Vision Library are shortly described below. 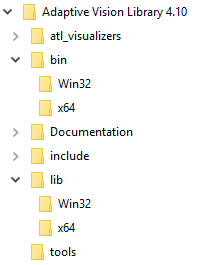 atl_visualizers – a directory containing the visualizers for Visual Studio Debugger of Adaptive Vision Library data types. bin – a directory containing dynamic linked library files (AVL.dll) for 32|64-bit applications. The libraries are common for all supported versions of Visual Studio and for Debug|Release configurations. All the functions of Adaptive Vision Library are included in the AVL.dll file. Documentation – a directory containing the documentation of Adaptive Vision Library, including this document. include – a directory containing all header (.h) files for Adaptive Vision Library. Every source code file that uses Adaptive Vision Library needs the AVL.h header file (the main header file) to be included. lib – a directory containing static (.lib) libraries ( AVL.lib ) for 32|64-bit applications. The AVL.lib file has to be statically-linked into the program that uses Adaptive Vision Library. It acts as an intermediary between the usage of Adaptive Vision Library functions and the AVL.dll file. The programmer creating an application does not need to bother about DLL entry points and functions exported from the AVL.dll file. Adaptive Vision Library is designed to be easy to use, so one only needs to link the AVL.lib file and can use all the functions from the AVL.dll just as easy as local functions. tools – a directory containing the License Manager tool helping the user to load the license for Adaptive Vision Library to the developer's computer. Examples – a directory located in the Public Documents system folder (e.g. C:\Users\Public\Documents\Adaptive Vision Library 4.11\Examples on Windows Vista/7) containing simple example solutions using Adaptive Vision Library. The examples are a good way of learning, how to use Adaptive Vision Library. They can be used as a base for more complicated programs as well. The shortcut to the Examples directory can be found in the Start Menu after the installation of Adaptive Vision Library. Adaptive Vision Library - contains all functions for working with images. Standard Library - contains all auxiliary functions like: file operations, XML editing or mathematical operations. GenICam Library - contains all GenICam and GigEVision functions. Third Party Library - contains functions of third-party hardware producers. Adaptive Vision Library uses the environment variable named AVL_PATH4_11 (4_11 stands for the 4.11 version) in the building process. The variable points the directory with the headers and libraries needed in the compile time (.h files and AVL.lib ) and in the run time ( AVL.dll ). Its value is typically set to C:\Program Files (x86)\Adaptive Vision\Adaptive Vision Library 4.11, but it can differ in other systems. The projects using Adaptive Vision Library should use the value of AVL_PATH4_11 to resolve the locations of the header files and statically-linked AVL.lib file. Using an environment variable containing path makes the application source code more portable between computers. The AVL_PATH4_11 path is typically used in the project settings of the compiler (Configuration Properties | C/C++ | General | Additional Include Directories) to find the header files, settings of the linker (Configuration Properties | Linker | General | Additional Library Directories) to find the proper version of the AVL.lib and in the configuration of Post-Build Event (Configuration Properties | Build Events | Post-Build Event | Command Line) to copy the proper version of the AVL.dll file to the output directory of the project. All the settings can be viewed in the simple example applications distributed with Adaptive Vision Library.